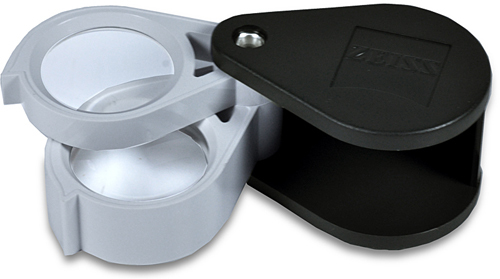 Zeiss Pocket Magnifier. An exceptional field of view for the magnification power; the aplanatic-achromatic design of the lens system provides distortion free view up to and including the peripheral zones; and an anti reflection coating which reduces lens reflection normally encountered with most lens. The glass is a Zeiss D36 (9x/3x+6x) with anti-reflection coating. (S101).